No 2 Palmerstown Grove, Portumna. The Connacht Property Auction will hold its fourth public auction event of the year at 7pm on Thursday next, September 13, in The Menlo Park Hotel, Galway. Registration will begin at 6.30pm. The company also has ongoing online auctions at www.connachtpropertyauction.ie which is proving more and more popular with buyers and vendors. The company will also hold its final public auction event of the year on Thursday, November 22. 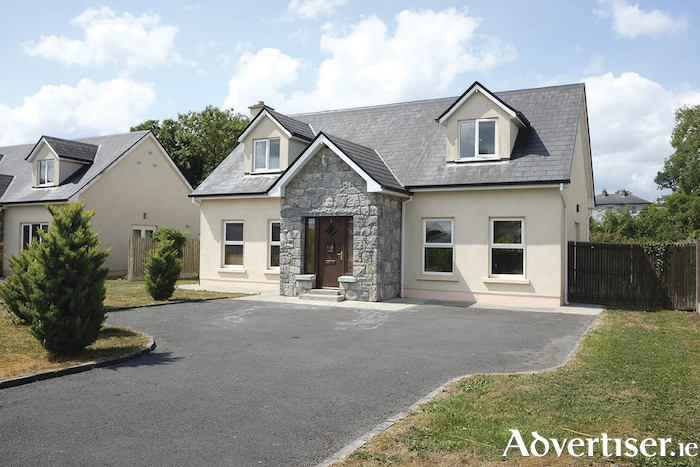 This well maintained four bed detached dormer residence is set in a quiet cluster of six detached houses located adjacent to Portumna Marina and the River Shannon, within easy walk of Portumna town centre. A rare opportunity to purchase two properties set on a site of c1.21 acres. Both properties are in need of complete renovation and are situated within walking distance of Carraroe village. The front house is a three bed detached bungalow providing circa 880 square feet, while the back property is a traditional stone cottage providing approximately 400 square feet of accommodation. The building appears to be structurally sound, of stone construction under a corrugated roof. To the rear is a small detached shed used for turf. Two storey three bed farmhouse on a large c1.25 acre site, lined with mature trees. The house is in good general condition but is in need of some modernisation. The property is ideally located just off the R446, approximately 400m from Kilrickle village. It is 8km from Loughrea and within easy commute of Galway and Athlone.